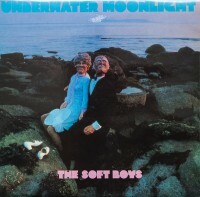 The Soft Boys opened their 1979 debut album, A Can Of Bees, with “Give It To The Soft Boys.” That’s what I’m about to do with this here review… praise, that is. For Underwater Moonlight is a stone-cold classic of neo-retro-psychedelic jangle pop, ablaze with memorable tunes and brilliant lyrics. According to some smart folks, it represents the peak of singer-songwriter-guitarist Robyn Hitchcock’s long, fruitful career. On certain days, I agree with that observation. The album kicks off with one of the greatest one-two punches in rock history. “I Wanna Destroy You” might be the ultimate righteous-revenge anthem. Musically, this is one of the most effusive and potent power-pop songs ever, but lyrically it’s utterly sulphuric in its vengefulness—against the media, apparently. And man does it feel good when Hitchcock euphoniously yelps into the chorus; the “I”s here just explode. “The Kingdom Of Love” veers almost 180º in the opposite direction. It’s a cool, cruising rocker that expresses an exalted yet surreal desire, as Hitchcock equates extreme infatuation with insects crawling under his skin. When the song reaches the part where he sings, “You grow out of me like a FLOWER!” it sounds like his heart’s literally bursting in ecstasy and the song ascends to its most heavenly level. If these two cuts were released on a 45, it would represent an all-time Top 20 single. The jittery, jangly, sitar-spiced power pop of “Positive Vibrations” makes you feel as good as the title would suggest. You’d best believe R.E.M. were taking notes while listening to this song. If you ever wondered what would happen if the Cramps were British absurdists, well, the leering, sleazy “I Got The Hots” would be your answer. “Insanely Jealous” gradually builds into an amphetamine’d blowout redolent of obsessiveness; the music’s a perfect analogue of the titular emotion. Hitchcock fans may hate me for saying this, but “Tonight” verges on cheesy, sounding like a middling, long-lost radio hit or TV movie theme. It’s really Underwater Moonlight‘s only weak link. But the LP rebounds with two of its toughest pieces: the intriguing and torqued instrumental “You’ll Have To Go Sideways” and “Old Pervert,” the most jagged, vicious, oddly metered song here—almost No Wave-y in its angularity and abrasiveness. Then there’s a weird segue into “Queen Of Eyes,” an amiable, Byrdsy jangle rock bauble, before the title track closes things with an ideal combo of the rousing and the slightly rueful. Hitchcock’s and Kimberly Rew’s guitars shimmer in a vaguely Eastern manner while also slashing and clanging with fervent rock gusto. So much gusto! Roll credits, exit theater feeling exhilarated. Then repeat… over and over.